On September 1, 1998, the Central Government of China banned all commercial logging in the catchment area of the Upper Yangtze River. The ban initiated the first phase of Natural Forest Conservation Program (NFCP, also often translated as NFPP, Natural Forest Protection Program). NFCP prohibits commercial logging and provides substantial funding for reforestation. Its first phase is scheduled to last until 2012. The logging ban, a key campaign of NFCP programs is having a dramatic impact on local Tibetan communities of SW China. NFCP offers the great opportunity to transform the forest industry in this region, which was geared towards maximum timber extraction, into sustainable forestry. However, current reform policies do not integrate the local Tibetan population. Livestock grazing issues and land use rights endangers these massive reforestation initiatives. Since mid 1950s the forestry industry developed into a key economic sector in the Tibetan administrations of South-West China. The timber industry provided substantial financing for local and prefectural governments. Road development and other infrastructure were largely funded by timber revenue. In the 1980s and 1990s, county administrations derived an estimate of 70% of their cash revenue from logging. In the case of Nyarong County (Xinlong Xian, Ganzi Tibetan Autonomous Prefecture [TAP], Sichuan) 96% of the county revenue was derived from timber sales according to county officials. However, most timber was allocated for sale to provincial agencies, sometimes even below production cost. Additional cost, such as worker's pension funds or reforestation was not calculated in timber price. Replanting of clear-cuts was seriously neglected by forestry bureaus until the early 1990s. Above 90% of the forest resources in the Tibetan areas of Sichuan remains under control by government agencies, whereas the Chinese national average is roughly 40%. There is conflicting information regarding the actual extent of community-controlled collective forests (`jitilin'). For example, for Litang County, a Ganzi TAP report figures `jitilin' forest areas at 18% and County State forests (`xianguo youlin') at 82% of Litang's forest area. However, when I quoted these figures to Litang forestry officials, I was told that 95% of Litang's forests are owned by the state. This contradicting information reflects the fact that, although local communities might own some forestland on paper, their ownership neither entitles them to forest management nor to profiting from state timber exploitation, a situation in stark contrast to non-minority areas in China. However, communities are entitled to extract timber for their own needs. Logging requires an application and a small payment to the forest bureau, which grants permission. Logging without permits for local household consumption results in serious fines. Forest resources in the Tibetan areas of SW China are estimated at 2.3 billion m3, whereas the whole of China is estimated at 11.6 billion m3. So far, no conclusive figures are available regarding the full extent of deforestation before the enactment of the logging ban in the Tibetan Plateau region. However, Chinese research indicates a reduction of 50% of forest cover between the mid-1950s and mid-1980s. Between 1950 and 1990 reforestation after clearcutting was an exception. In the early 1990s reforestation efforts and nursery production were clearly increased, since resource exhaustion impacted several forest bureaus. Forest ecosystems are located along the valleys of Yangtze, Yalong, Mekong, and Salween River and their tributaries. The summer monsoon brings in over 80% of the annual precipitation. In contrast, winters are very dry and cold. Forest ecosystems receive between 500mm to 1500mm annual precipitation. The rugged terrain fosters a wide range of temperatures, precipitation and evaporation, contributing to high biodiversity, especially along the outer fringe. Treeline reaches 4650m, the highest in the world. The forests consist mainly of fir-spruce forests, but a strong broadleaved element is admixed (see Tab. 1). Degraded south slope sites are frequently covered by evergreen oak or in more continental sites by juniper forests. Human impact has dramatically reduced forest ecosystems on the Tibetan Plateau through the millennia. Valley grounds, wide ridges, plateaus and rolling hills have all been cleared for pastureland. Additionally many slopes, especially south-facing ones have been converted into grazing land. Relict forests are found near monasteries from Lhagang (Tagong, Kangding County, Ganzi TAP, Sichuan) to the Lhasa area and beyond since Buddhism regards all live as sacred and forests are recognized as wildlife habitat. Also, countless forest-free slopes all over the region still bare individual conifers or small stands testifying to former widespread forests. However, when I bring this subject up with local foresters, most of them are skeptical that many forest areas were reduced so dramatically in historical times. 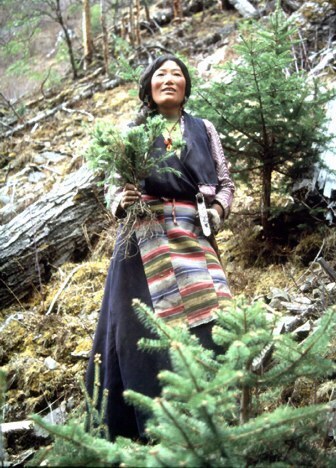 Forests were traditionally regarded as a common asset by Tibetan communities and were primarily utilized as a resource for construction timber and firewood besides many forest by-products such as medicinal plants and mushrooms. The disappearance of forests in wide areas of the region indicates a lack of sustainable forest use traditions. Thus, deforestation and forest fragmentation has a long-standing history on the Tibetan plateau. The local culture of Kham, as the area comprised of Ganzi, Deqen, Qamdo and Yushu Prefectures is known to Tibetans, has developed as a natural response to a challenging climate and topography. Techniques of agricultural production and pastoralism have been maintained over centuries conserving and ever extending a delicate resource of pastureland. Pastoralism is based on seasonal movement of livestock (yak, sheep & goat) between high-altitude summer pastures (above 4000m) and lower winter pastures. Movement of herds rarely exceeds 20km. Agricultural settlements are predominantly based in valleys below 3800m. Agricultural subsistence production focuses on barley as well as some wheat, potato and mustard. Traditionally, cash income has been generated through collection and sale of medicinal mushrooms, plants and wildlife derived substances (i.e. musk glands, deer antlers). The most important market for these non-timber forest products (NTFP) has been Traditional Chinese Medicine (TCM), although some were also utilized in Tibetan Medicine (TM). This activity greatly expanded following economic reforms in China after 1981 and with the increase of dispensible income of China's new urban middle class. Additionally, international market demand for wildcrafted plants, particularily medicinal herbs has increased due to growing use of TCM, TM and alternative herbal formulas and remedies. Caterpillar fungus (Cordyceps sinensis), one of the most important economic plants, is collected in spring throughout the grasslands. Collection of Yartsa Gunbu, as it is known in Tibetan (Pinyin: Chongcao), provides often 50% to 70% of the annual cash income in nomad communities. In areas with evergreen oak or pine forests, Matsutake mushrooms (Tricholoma matsutake) are collected during the summer monsoon for export to Japan. "Everybody that can walk" as I was told in Litang, is collecting matsutake. This resource, which was `discovered' in 1988 in Deqen TAP (NW Yunnan Province) already faces serious threats due to unsustainable harvesting practices. Japanese customers prefer very young mushrooms, which fetch the highest price on the local market ($16 to 50/kg).Thus collectors dig for buds and hurt the mycelium. A governmental regulation requiring a certain minimum size for trade could be enforced relative easily, since export is controlled by a few companies. Mushrooms and medicinal plants offer great potential for income generation in the Tibetan areas. However, sustainability issues need to be addressed or harvest will be adversely effected. Also, value can be added. The NFCP contains a program known as `Green for Grain' (tuigeng huanlin), which promotes revegetation of sloped agricultural areas by local farmers to reduce erosion. Planting of conifers (`ecologic forests') and fruit trees (`economic forests'), such as apple, pear, peach, etc. and nut trees, such as walnut, chestnut, and Sichuan Pepper (Zanthoxylum bungei) is common. Also planted is Eucommia ulmoides, the hardy rubber tree [Its bark is known in TCM as `duzhong'. It is also a source of latex for industrial use] and sea-buckthorn (Hippophae rhamnoides), a small tree well-adapted to reclamation of degraded areas. It produces berries used in fruit juice production and as flavoring. Local farmers are enthusiastic about planting orchards, which they hope will broaden and improve their income base while reducing their agricultural workload. In Nangchen County (Yushu/Gyegu TAP, SW Qinghai) farmers will receive 100kg grain per mu (15mu =1ha) over the next 5 years and an additional 30 RMB/mu ($55/ha) in cash for planting. In the Yangtze catchment farmers are entitled to 150 kg per mu. However, the program's long-term benefits cannot be assessed yet. It is unclear how local households will derive an income after seven years from planting conifers, which take several generations to mature. If government subsidies will not being provided beyond this date, the success of this aspect of Grain for Green is very questionable. In addition, overproduction of fruits and nuts may lead to loss in product value. In 2001, increased demand for nuts and new fruit varieties have kept prices rising in Sichuan. Processing facilities, which add value and create jobs need to be established. With the implementation of NFCP, reforestation and seedling cultivation receive more attention and substantial funding from the Central Government, which is a very positive development. However, local Tibetan communities and grazing issues continue to be overlooked. There are limited efforts to involve local stakeholders into the forestry sector. However, seedling survival cannot be guaranteed unless grazing pressures in reforestation plots is kept in check. Lack of participation of local people in forestry is based on two factors; 1. Logging operations have been managed and carried out primarily by Han Chinese technicians and workers from outside the region. 2. The logging ban has eliminated the economic base of these state-run logging units. Reforestation work is now a key activity to keep government logging units employed. Forestry officials admit that the current NFCP reforestation program aims at providing income to these units. Fencing reforestation areas is very uncommon in Tibetan areas despite the large numbers of livestock. Although the government is subsidizing extensive, controversial fencing programs in the grassland areas, forestry officials state that high fencing costs are prohibitive. However, fencing is not carried out due to lack of communication between local herders and forestry officials. Officials are aware that fencing is ineffective without consent and participation of local herders. Compensation to herders for lost grazing land is not considered by forestry officials. The situation is complex since local herders have grazing rights for localities. Once the forest is clear-cut, they are glad to exercise their land use rights and clear cuts are quickly turned into valuable grazing grounds. Grazing rights of a community typically apply to an entire valley and not just to preexisting pastures. However, the Forestry Bureau regards the clear-cut still as forest area. To accommodate the conflicting interests some forestry bureaus insert wooden sticks or battens around seedlings, primarily native spruce, to protect them from livestock trampling and biting. This method improves survival chances for seedlings, but requires maintenance to be efficient. It also is of limited value if grazing pressure is too high. In many discussions local people have expressed their positive attitudes towards reforestation. There is also an awareness that excessive logging on steep slopes can cause serious erosion and devastating debris flows, which endanger and destroy homesteads, fields and roads. Close to such sites local households fully support reforestation. However, current forestry practices provide very few incentives to local participation. While discussing a reforestation project in Sertar County (Pinyin: Seda Xian, Ganzi TAP) a local forest guard told me "we like to plant seedlings, but we are worried that they will grow into big trees and reduce our grazing area". In Litang County, villagers made it very clear that they prefer to plant fruit trees over conifers. These views are very pragmatic, since state-sector logging produced negligible direct benefits for local people, whereas herding has secured survival for Tibetan communities for centuries. Herders will not forego grazing clear-cuts unless they receive economic incentives. Successful reforestation is not achievable without securing support from local stakeholders. Herders will only become stewards of the forests if forestry and NTFP income contributes a reliable part of their livelihood generation. Also, in the long run tangible, sustained benefits from forestry would reduce the dependency of local economies on herding with its negative impact on reforestation. Currently, there is the opportunity to use some of the reforestation funding coming from the Central Government to employ local communities holding grazing rights to reforestation areas in planting and maintenance work as well as forest guarding. Such forms of income generation can also be offered in exchange for not grazing reforestation plots. Additionally, policy changes are required to ensure successful forest restoration and conservation. Community forestry or local participation beyond simple manual labor input are currently neither practiced nor seriously considered by state agencies in the region, although elsewhere in China it is already common practice. There needs to be a shift away from employing a costly outside workforce towards integrating local people. Local people are very interested in forestry work and capable of carrying out labor under guidance of state foresters. This has been proven in cooperations between local communities, forestry bureaus and TBF in Litang, Nyarong and Sertar Counties (all Ganzi TAP). In Litang, TBF provided annually funding for employment and environmental training of a local Tibetan workforce since spring 1999. In 2001, Lendo village has agreed to support fencing of a 1000mu (67ha) reforestation plot, where Lendo's yaks seriously endangered seedling survival. TBF has provided funding for fencing and road improvement, which made an old track to a grazing area recently lost to logging induced erosion passable again. All work is carried out by villagers, the forest bureau is assisting. In addition, the village will receive recompense over 5 years for plantation guarding and not exercising their grazing right. Fencing, road repair and recompense over 5 years amount to 20 RMB per mu per year ($36/ha), while the forest bureau would be entitled to a maintenance fee of 18 RMB/mu. In comparison, reforestation of 1 mu cost a total of 150 to 220 RMB ($274-$402 per ha) including site preparation, planting, seedlings etc. More programs, such as TBF's, are needed to provide alternatives to the old system, which is averse to fencing of reforestation plots and integration of local people. In Litang and other program sites, TBF is committed to supporting environmental, planting and maintenance training for locals, so that they are better prepared to participate and benefit from the forestry sector. Additionally, income generation programs based on sustainable use of NTFP are a very efficient way to advance forest protection. The region's wealth in marketable plants is conducive for such initiatives. TBF is currently developing NTFP programs in the region. Local people will treat forests different when they represent an important asset to their local economy. The Central Government's recent interest in watershed protection and natural forest conservation as outlined in NFCP has transformed the region's forestry sector. The `green for grain' program represents an encouraging step towards integration of local households. However, in the first years of NFCP participation of locals in reforestation work has not received the necessary attention. The current reform of the forestry sector needs to advance the integration of local Tibetan population into forestry. Protecting conifer plantations from grazing animals will not produce satisfactory results as long as it is diametrically opposed to the local economic reality. New approaches for seedling protection, such as fencing with full local participation need to be advanced. Empowering local people through actual participation in the restoration of the local forest areas and consecutive integration in the forestry sector, which will return to timber production at some point in the future, might prove to be the prerequisite for long-term success.